Back in 2017, Xioami introduced the Redmi Y-series in India followed by the Redmi Y2 last year. Targeting youth (that what the “Y” stands for), both – the Redmi Y1 and the Redmi Y2 – come with impressive selfie cameras at a budget and Xiaomi now appears to be preparing for the third device in the series. The Redmi Y3 was recently certified by the Wi-Fi Alliance, thus confirming that the Redmi Y2 successor is on its way to being unveiled. Xiaomi Redmi Y3 was spotted on the Wi-Fi Alliance portal and the listing reveals that the smartphone will come with MIUI 10 based on Android 9 Pie. Apart from revealing the information about the software, the listing tells us Redmi Y3 will support only the 2.4GHz band for Wi-Fi. The lack of the 5GHz band hints that Xiaomi is still aiming at a budget pricing for the smartphone. We can easily expect it to be priced under ₹10,000. 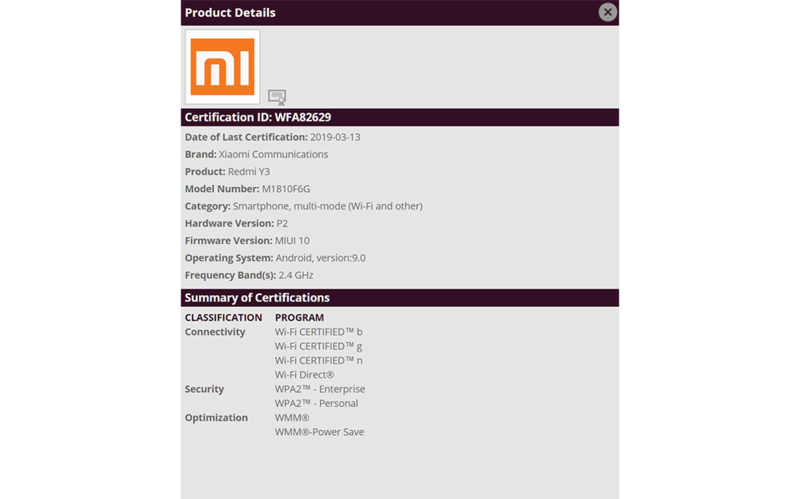 Aside from revealing the version of Android and informing us about the Wi-Fi bands, the certification tells us that Redmi Y3 will bear the model number M1810F6G, although this information is of minimal advantage to users. The specifications of the Redmi Y3 are not known yet but we can expect Xiaomi to upgrade from the Qualcomm Snapdragon 625 on the Redmi Y2 to at least Snapdragon 632 or Snapdragon 636, if not a Snapdragon 660. Similar to other Xiaomi devices in the segment, we anticipate 3GB or 4GB of RAM and 32GB and 64GB options in terms of storage. Like the previous devices in the Y-series, Redmi Y3 is likely to be a selfie-centric device and have a better camera than the 16MP f/2.0 wide-angle sensor on the Redmi Y2. Further, if the last year’s trends still hold good, the Redmi Y3 should be priced less than what the Redmi Note 7 starts at i.e. ₹9,999 . We can also expect an upgrade from the 3,080mAh battery on the Y2 as well as see a Full HD+ display, perhaps with a notch, instead of the HD+ display from last year’s model. Do note that these are just speculations and must be taken with a pinch of salt. We shall update you as we learn more about the Redmi Y3 from credible sources before the launch.